1. Kevin has four red marbles and eight blue marbles. He arranges these twelve marbles randomly, in a ring. Determine the probability that no two red marbles are adjacent. 2. Six people in chemistry class are going to be placed in three groups of two. The teacher asks each student to write down the name of that... show more 1. Kevin has four red marbles and eight blue marbles. He arranges these twelve marbles randomly, in a ring. Determine the probability that no two red marbles are adjacent. 2. Six people in chemistry class are going to be placed in three groups of two. The teacher asks each student to write down the name of that student’s desired partner. If each student picks a favorite partner at random, what is the probability that there is at least one pair of students who have picked each other? Update: For the first problem, the objects are arranged in a ring, not a linear configuration. I assume the problem does take invariance under rotation into account. If there are twelve fixed (and distinct) spots around the ring, we cannot assume invariance under rotation anymore, and 7/33 looks right to me. If we are to put the 12 objects on the continuous circumference, I think the assumption of rotational equivalences is necessary, and Duke's answer (and my original answer) of 10/43 looks correct. Is my argument sound? I didn't realize whether we are treating the ring as a continuous circumference will make such a difference. Best Answer: I do not agree with the answers to the first question. 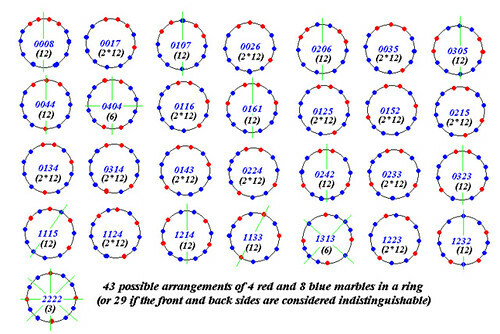 Under the assumption that two ring arrangements of 4 red indistinguishable and 8 blue indistinguishable marbles are identical under rotation only (i.e. the reverse side of the ring is considered a different arrangement, treating it like a coin) I think the required probability is 10/43, as we have discussed in our private emails (without distinguishing front and back sides, i.e. left from right neighbors it would be 8/29). 0116 means the string -R-R-B-R-B-R-B-B-B-B-B-B- with connected ends (2nd row, 3rd from left on the picture). Cutting the ring between any 2 marbles and rectifying the string we get an arrangement of the 12 marbles in a row. Turning the above ring we get 6110 - its mirror image - another arrangement according the initial agreement. or 40*12 + 2*6 + 1*3 = 495 = C[12, 4] row arrangements. P.S. (Note to Gianlino) I do not understand what You have written: "You have a ring with 12 spots. You put 4 red marbles and 8 blue marbles at random. That will give you 12 Choose 4 possibilities..." Take a ring with 3 spots and put 1 red and 2 blue marbles at random. How many ring arrangements are possible? Are they C[3, 1] = 3? Now I hope this reference is sufficiently convincing. P.S. (3 - Final) In my opinion the words "...He arranges these twelve marbles randomly, IN A RING..." along with the 1st clarification in the Additional Details imply the number of possible cases is the number of ring arrangements (necklaces). Since I may be wrong, next time I am going to ask Kevin before answering. Looks like this problem is getting lively. Haven't even thought about #2 yet ... got go watch the baseball game and take care of the kids. But I might come back this evening if I'm not too tired. For 1/ you can look at this very similar question. edit Totally disagree with M3. 8*7*6*5 / 12*11*10*9 = 7*240 / 120*99 = 14 / 99.
edit: for 1/ I forgot a factor 8/12 in the denominator. So the answer is 3/2 * 14/99 = 7/33, as found by Ericlord. edit for 2. There are 15 pairs; Each has a probability 1/25 to be matched. So the expected number of matched pairs 15/25 = 3/5. Let p_x, x = 1,2,3 be the probability that exactly x pairs are matched. Hence p_1 + 2p_2 + 3p_3 = E(x) = 3/5. You are looking for p = p_1 + p_2 + p_3 = 3/5 - p_2 - 2p_3. (1875 - 216 - 6)/3125 = 1653 /3125. Edit I disagree with Duke's answer but I think we just did not tried the same problem. You have a ring with 12 spots. You put 4 red marbles and 8 blue marbles at random. That will give you 12 Choose 4 possibilities. Now the question is that "no two red marbles are adjacent." ok you have N possibilities. Divide by N by 12 / Choose 4 and you get your probability. The ring structure is here to make a distinction with a row of 12 but noone ever spoke of invariance of any kind. It is just the question of what is adjacent to what which marginally changes from the ring case to the linear case. edit Oh actually, the asker did speak of invariance, but just as some kind of personal assumption. Noone in his source does. to Duke exactly. Yes. The guy who is going to put down the marbles does not even know that rotations exist. It's not like choosing from various arrangements. You have a guy to whom you asked to put 12 marbles around who knows what, with the non adjacent requirements. But he forgets. What are the chances you'll yell at the end? Might as well comment on this. Hopefully I don't make an error and add to confusion. 1) It is valid to consider 495 equally likely arrangements as has been done by others, noting that some of these arrangements are equivalent up to rotation. This means: If we consider all distinct arrangements up to rotation, we may have difficulty using these counts for probability because *they are not all equally likely* given a random placement of marbles. Considering just the linear case, there are C(9,4) = 126 arrangements in which no two red marbles are adjacent. But of course we must take out those that have marbles in both the first and last positions. There are C(7,2) = 21 of these. So in the end we get (126-21)/495 = 7/33, in agreement with some previous answers. which matches what bright s hell got. There are 12C4 = 495 possible arrangements (495 ways the four red marbles can be distributed in 12 positions). There are 12 arrangements in which all four red marbles are adjacent. 12x7 = 84 ways in which just three are adjacent (ie, 12 sets of three adjacent positions in the ring and in each case 7 positions for the remaining red marble). 12x7/2 = 42 arrangements with two adjacent pairs of red marbles, not adjacent to each other, and 12x(6+5+4+3+2+1) = 252 arrangements with one adjacent pair and the other two red marblesisolated by adjacent blue ones. Altogether, then, we have 12 + 84 + 42 + 252 = 390 arrangements in which two red marbles are adjacent. Therefore the probability that NO two red marbles are adjacent is 1 - 390/495 = 7/33. Now we want to have at least 1 blue marble in between any red marbles, we can think a red-blue pair as one marble with red on left & blue on right of the pair. Thus we have 8! / (4! * 4!) = 70 ways to arrange the marbles. If one red-blue pair is at the very right of the row then in this case the blue marble on the right can be transferred to the beginning of the line. we can have 7! / (4! * 3!) = 35 ways for one red-blue pair to be on the very right, hence there are 35 ways to transfer the blue marble, for a total of 70 + 35 = 105 ways to arrange 4 red marbles and 8 blue marbles in a row so that no two red marbles are together. A can select from 5 other persons however for B, if A has selected him he can not select A & him self so he has only 4 ways but if A has selected any player other then B then B can also select from 5 & so on. Will think more about it & come later. Well for Q2 gianlino, bright as hell and siamese_scythe has got it right, I liked gianlino's explanation, which is somewhat easy to follow. same assumption as M3, rotation as same but not reflection (unless the marbles are drilled and stringed to make a pearl-ish bracelet, so i can put it down in 2 ways). there will be no pair if their desire-arrows are in a loop; that they make sides of polygons, at least for the more "desirable" students. Duke is right. i missed 1 arrangement. my previous, incomplete n[1,1,1,1] = 9 came from these strings indicating the number of B between 2 R.
i missed the obvious 2222. A can select any one person from B,C,D,E,F.he has 5 ways.